Dr. Nedashkivska is an Associate Professor of Slavic Applied Linguistics in the Department of Modern Languages and Cultural Studies at the University of Alberta, where she teaches Ukrainian language, culture, and Slavic and Applied linguistics courses. Currently she is also an Acting Director of the Ukrainian Language Education Centre at the Canadian Institute of Ukrainian Studies, where she participates in a number of educational projects and conducts research on language pedagogy and second language acquisition in Ukrainian. She also publishes in the areas of Slavic linguistics, discourse analysis, gender linguistics, as well as political and media language. 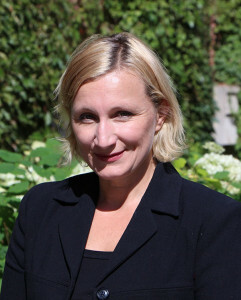 She authors Ukrainian language textbooks, one of which Ukrainian Through Its Living Culture, an advanced Ukrainian language textbook published by the University of Alberta Press in 2010 has won the 2012 AATSEEL Book prize for “Best Contribution to Language Pedagogy”. Of note, she was the recipient of the 2008 Undergraduate Teaching Award from the Faculty of Arts at the University of Alberta for her excellence in undergraduate teaching and her dedication to language instruction. On an international level, she served as the Division Head of Linguistics and Program Committee Member for the American Association of Teachers of Slavic and East European Languages (1998-2005). Her research interests in discourse of language and media in Ukraine, linguistic cyberlandscape and issues of bilingualism/multilingualism in Ukraine apply directly to this project. Alla proposes to focus on social media texts produces by the broader Ukrainian community, that is, by those geographically in Ukraine and those in the Diaspora. The emphasis is on social networks, in which discussions about the language(s) question in Ukraine and by Ukrainians are prominent. These texts constitute examples of public discourse on the language question in Ukraine and by Ukrainians. The project explores language practices in online communication, analyzing first language choices, but also linking the results to concepts of ‘Ukrainianess’, and possibly to linguistic imperialism and global orientation. The study concentrates on discursive strategies in social media texts, narrowed down for the analysis, drawing on some descriptive and critical principles of discourse analysis in order to highlight and explain various constructions of ‘Ukrainianess’. It also touches upon other concepts that will certainly emerge, via language in relation to a broader societal context, specifically Ukrainian society in a state of war. The results are linked to changes in national identity, language ideologies and language attitudes of the studied communities due to Maidan and Russian state aggression. Overall, she aims to analyze the relationship between social media texts, language use, symbolic construction of ‘Ukrainianess’ in these texts, and its relevance to societal and community issues and changes. “Language Practices of Pride and Profit: The Tourist Landscape.” New Insights into Slavic Linguistics. Sprach- Und Kulturkontakte in Europas Mitte Studien Zur Slawistik Und Germanistik. Eds. Jacek Witkos and Sylwester Jaworski. Frankfurt am Main, Bern, Bruxelles, New York, Oxford, Warszawa, Wien: Peter Lang, 2014. 283-296. “Childhood in Ukrainian media: discursive study of Ukrainian and Russian language magazines.” REGION: Regional Studies of Russia, Eastern Europe, Central Asia 2013, 2.2 (July). “Language Situation of Cyber Ukraine.” Zeitschrift für Slavische Philologie 2011, 67.2: 407-440. “Symbolic Bilingualism in Contemporary Ukrainian Media.” Canadian Slavonic Papers 2010 vol. LII, Nos. 3-4: 351-372. “Gender Voices in Electronic Discourse: A Forum in Ukrainian,” Journal of Slavic Linguistics: Special Issue in Slavic Sociolinguistics, vol. 17 (1-2), summer 2009: 217-45. “Presidential Speech and Processes of Language Democratization in Contemporary Ukraine,” Australian Slavonic and East European Studies vol. 20, nos. 1-2 2006: 39-65. “Orthographic Innovations and Variations in Contemporary Ukrainian,” Written Language and Literacy 9 (2), 2006: 265-281. “Communicating with the Press: Genderlects in Ukrainian,” Canadian Slavonic Papers vol. XLIV, nos. 1-2, March-June 2002: 97-124. “The Language of Polarized Femininities in Contemporary Ukraine,” Journal of Ukrainian Studies, vol. 27, no. 1-2, 2002 (special issues in memory of the late Danylo Husar Struk): 295-319.